This is a normal distribution. It can be assumed for many kinds of population measurements, such as IQ, human height, reaction speed, and shoe size. It basically means that most measurements will be close to the average (μ), and very few measurements will be far from the average. 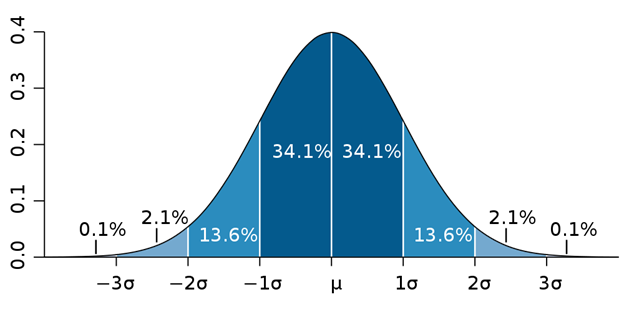 Specifically, 68% of the population is within one standard deviation, 95% is within two standard deviations, and 99.7% is within three standard deviations. Imagine if shoe companies supplied a large selection of shoes in size 7 and 15, and only had a few for the average man’s shoe size 11. Stupid. 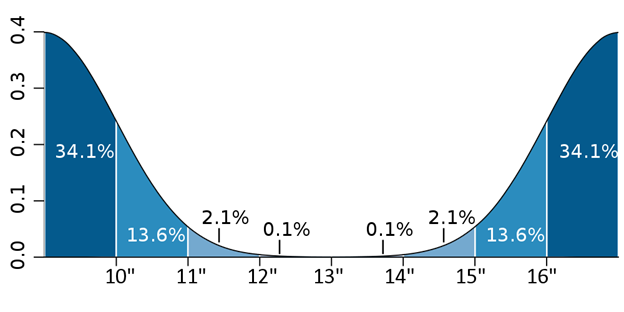 I firmly believe that demand for laptop screen size follows a normal distribution: most people want the average size, about 13”. Few people would want to carry around a 16” theater. On the other end, few people would want a 10” screen, which requires you to either hunch your back due to high resolution, or deal with horizontal (and vertical) scroll bars due to low resolution. Supply should follow this normalized demand: 13” laptops should be the most mass-produced, and thus probably carry the cheapest price tag. Recently, selection and pricing for the average screen size have slightly improved. It only took 5 years. Laptop screen size is not the only consumer demand that computer manufacturers have ignored. Instead of paying attention to human limitations, manufacturers adhere to Moore’s Law. This was originally just a prediction that said the number of transistors on an integrated circuit doubles every two years. Today, Moore’s Law is basically synonymous with exponential growth and has been applied to all things electronic. Manufacturers always strive for exponential growth, and often neglect human limits. Well, consumers are humans. We don’t want a screen with more pixels per inch than our eyes can perceive. We don’t want a screen so bright that our eyes tear when we look at it in the dark. We don’t want a high-resolution screen that makes text smaller, which eventually leads to leaning in to read. We don’t want a device so small from nanomanufacturing that our hands can’t use it with ease. We don’t want a processor that calculates the billionth digit of pi in a billionth of a second. We’ve reached the point where any more computational power or memory is the result of inefficient software. More is unnecessary because it’s beyond human limits. In my opinion, the primary function of the CPU is to encode and decode (compress and decompress, encrypt and decrypt). Information is encoded before transmission and decoded upon reception. This mostly comes from using the internet and watching video – essentials. The secondary purpose is drawing unpredictable graphics in real-time. This mostly comes from scrolling in a browser, switching tasks or windows, or playing video games – all not essentials. Scrolling and swiping can appear as jerky frames so long as it’s consistent and responsive to user input. In actuality, the CPU is often used for gimmicks. In Windows, for example, if you click on a task in the taskbar, it visually expands or contracts. A huge gimmick is Window’s Aero Flip 3D. A lot of CPU usage goes toward really intrusive advertisements. Basically, a fast CPU is needed for glittery MySpace pages, which was replaced by the superior, simple design of Facebook, which is why adherence to Moore’s Law is dumb.